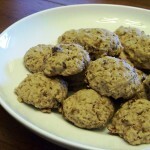 Domestically Inept: The Best Darn "Clean" Cookies Ever. Period. The Best Darn "Clean" Cookies Ever. Period. There is a new catch phrase buzzing around the dieting world, its called the "clean diet." This is really just a hip and fancy name for eating healthy! It actually isn't anything new....in reality its about looking back, eating the way our ancestors used to eat. The so-called "clean" diet just means eating things that are in their most natural state as possible. That means NO processes, no added chemicals etc... Well this is really what de novo (from scratch) baking is all about. For more information about the clean-eating diet, check out The Eat Clean Diet. First you cream together the butter and the sugar on medium speed for a couple of minutes. I typically use some type of raw cane sugar. Most grocery stores are starting to carry it. Typically you can find it in the health/organic foods section. I wait for it to go on sale and stock up. Otherwise it can get expensive. 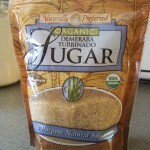 If you absolutely cannot find/afford raw can sugar then I recommend substituting light-brown sugar. While those are creaming, mix together all the dry ingredients: the flour, oats, salt, cinnamon and baking powder and set aside. Spelt Flour (an ancient grain flour available in the whole foods section of the grocery) works really great in this recipe. However, it can be hard to come by and can be quite expensive. Spelt is a very close relative of wheat so I will often use King Arthur Whole-Wheat Flour instead and have been told you can't taste the difference. Once the butter and sugar are creamed add the egg and allow it to fully incorporate into the mixture. Next add the vanilla extract. Now turn the mixer down to low and mix in the dry ingredients and the milk. 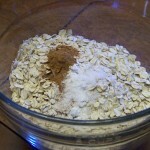 This is done by alternating the two, beginning and ending with the dry ingredients. Lastly, its time to mix in the fruit. The one thing I love about this recipe is the flexibility it provides. 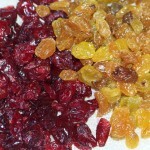 You can use any dried fruit you have on hand; raisins, currants, dates, cherries etc. I prefer to use golden raisins and dried cranberries. I love the bold colors of the two. I think it makes for a prettier cookie. Another great addition would be to add some chopped almonds or some other kind of nuts. I typically do not add them but if you choose to do so I recommend substituting them for some of the dried fruit. 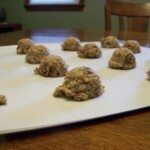 Drop the cookies onto parchment-lined baking sheets and bake at 350 degrees for approximately 14-16 minutes. Makes approximately 2 dozen cookies.